These cushioning walker tennis balls protect floors and glide easily, ensuring that your walker won’t slip on smooth surfaces or snag on carpeting. 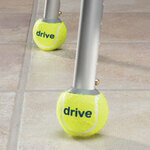 A walker accessory you won’t want to be without, tennis ball glides are precut to fit standard walkers. Set of 4 walker glides. 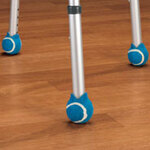 Tennis ball walker glides help your walker move smoothly and quietly on all kinds of surfaces. 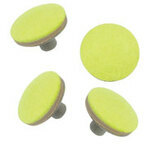 Walker tennis ball glides are ready to install easily without cutting. Includes 1 pair of ball glides and an extra pair of glide pads. Fits standard 1" walker tubing. When used with our Tennis Ball Walker Glides, these walker glide cap replacements help your walker move smoothly and quietly on all kinds of surfaces. Walker glides come ready to install easily without cutting. Set of 4.